The Silverbug community is back at it with a new Silver Fairy Round release for 2016. In this all-new design, the Silverbugs have introduced not just a new fairy, but also an intriguing new reverse finish that is sure to capture the imagination. Right now, the 1 oz Silver Proof Silverbug Alyx the Fairy Round is available on Silver.com in new condition. Proof mintage capped at 10,000 rounds in total! Third Silverbug Silver Fairy design! Arrives in an AirTite plastic capsule including Certificate of Authenticity. Artwork from Steve Ferris and edge lettered serial number. Obverse and reverse sculpted by Luigi Badia. Obverse features Alyx the Fairy. Reverse bears the scarab bug. 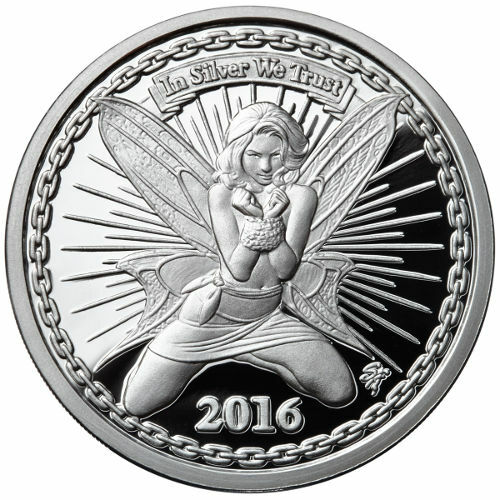 Silverbug Silver Fairy silver rounds debuted in 2014 with the release of the Ariana design. Due to its massive popularity and quick sellout, another design arrived in 2015 featuring the Archer fairy design. 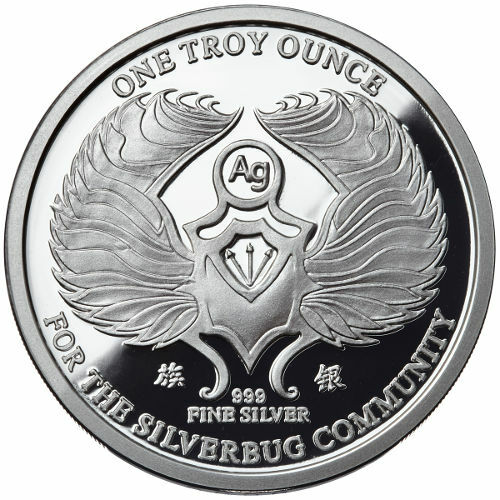 All Silverbug Silver Fairy rounds feature the same reverse design of a scarab bug, with a slight twist on the 1 oz Silver Proof Silverbug Alyx the Fairy Round. For this all-new silver round, the Osborne Mint hand-carved the scarab bug on the reverse face to add dimension and relief to the design’s finish. Already a popular reverse design, this new finish is sure to increase the demand for this popular silver round series. On the obverse of each 1 oz Silver Proof Silverbug Alyx the Fairy Round is the image of Alyx. Created by science-fiction and fantasy artist Steve Ferris, the concept for Alyx comes directly from the Silverbug community and represents the modern state of the silver market. Alyx is accompanied by chains in the design as a representation of market manipulators holding back silver, but she appears poised to break free of her constraints at any time. The reverse of the round bears the aforementioned scarab bug design. The design elements of the scarab bug, with the exception of its new hand-carved finish, remain the same as used on previous rounds in the series. Osborne Mint is now responsible for the production of Silverbug Silver Fairy Rounds. Each 1 oz. Silver Proof Silverbug Alyx the Fairy Round features edge lettering, and was produced at the Osborne Mint, which traces its roots back to 1835 and is considered the oldest private mint in the United States. Please feel free to reach out to Silver.com with any questions you might have about these rounds. Our associates are available at 888-989-7223, online using our live chat, and via email.